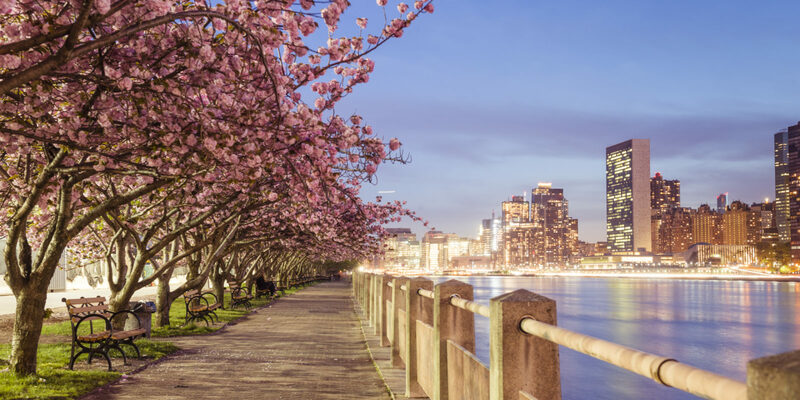 Every season offers a reason to love the Big Apple, but spring in New York City brings a joyful sense of renewal that’s best appreciated outdoors. Fans of the classic song “Autumn in New York” may beg to differ, but I’ve always found springtime in the Big Apple to be the most inviting. As temperatures warm, days get longer, rooftop bars reopen and vibrant green buds emerge in city parks, it’s an annual rite to get outside and appreciate the natural beauty that’s poking through all the manmade steel and concrete. Every year, I enjoy a few springtime rituals that help me appreciate the season to the fullest. Brush up on botany in Central Park. I lived on the Upper West Side for 20 years and always considered Central Park my backyard — even though I had to share it with millions of other people. I still spend time walking, running and daydreaming there year-round, but I always find myself counting the days until late March, when nature begins heeding the sun’s call to burst forth in all of its technicolor glory. 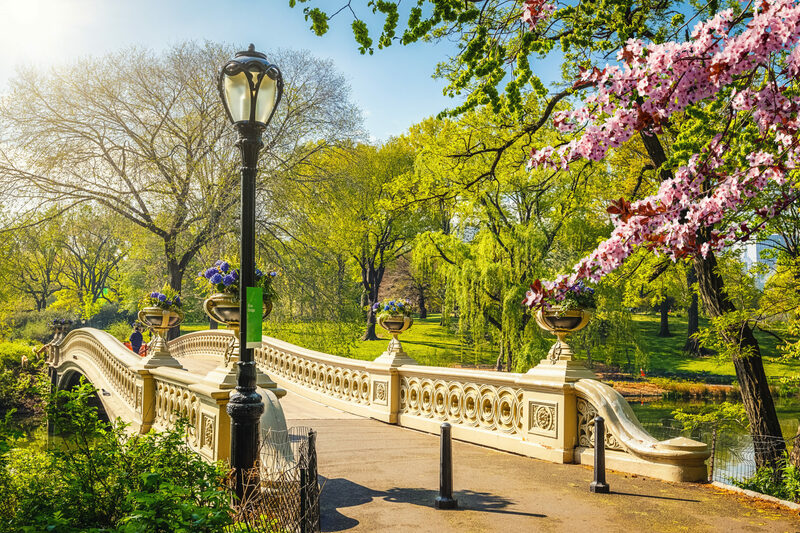 There’s no better place to enjoy spring in Central Park than the east side, where flowering trees planted a century ago frame the walkways from late March to mid-May and the Conservatory Garden at 105th Street blossoms in an ever-changing kaleidoscope of color. When I lived nearby, I often took the “scenic route” home from work — past the cheery yellow daffodils that line the East 69th Street entrance, the intense fuchsia azaleas and rhododendrons around Bethesda Terrace and the serene clouds of pale pink blossoms on Cherry Hill. Admire the skyline by walking the High Line. I have a confession to make: in recent years, I’ve been cheating on Central Park with a newer, trendier green space — the High Line. 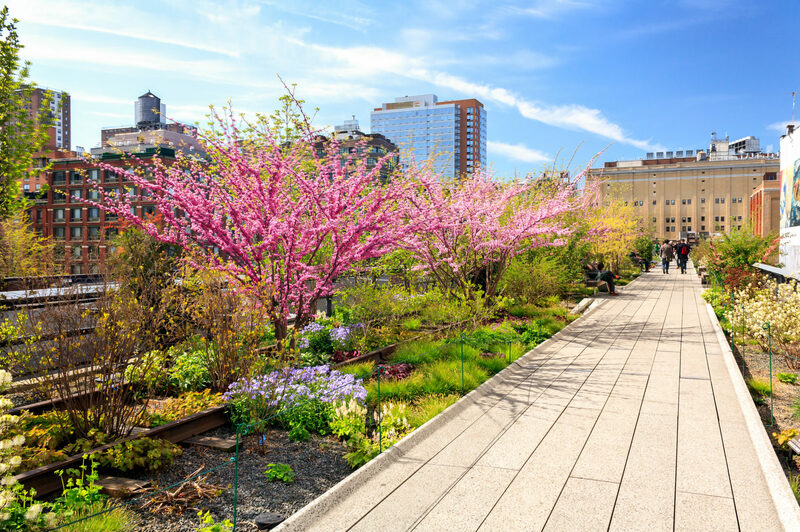 This 1.5-mile-long urban park set atop an abandoned rail line runs from West 34th Street near 11th Avenue in Chelsea to Gansevoort Street in the Meatpacking District. It’s the perfect spot to enjoy a walk and appreciate some of the city’s oldest architecture (including the Empire State Building, the Met Life Tower and the London Terrace Apartments) and newer additions (like the Whitney Museum, the IAC Building and the Chelsea Nouvel). I love to wander amid the nascent foliage — mostly native plants and grasses — and take a break at Terroir On The Porch, a wine bar located on the High Line at 15th Street and open seasonally. After all, there’s nothing New Yorkers love more after a harsh winter than sitting outside in the late spring sun and sipping a glass of vino. Get your fill of Coney Island thrills. When I feel like embracing the sun along with a fresh ocean breeze — and enjoying a bite of summer before the July-through-August crowds arrive — I hop on a Brooklyn-bound D train from Manhattan to Stillwell Avenue (the F, N and Q go there as well) and take a stroll along the legendary Coney Island boardwalk. It’s open year-round, as is the original Nathan’s Famous hot dog stand. The hot dogs are savory, but the thick-cut French fries have always been my favorite nibble. 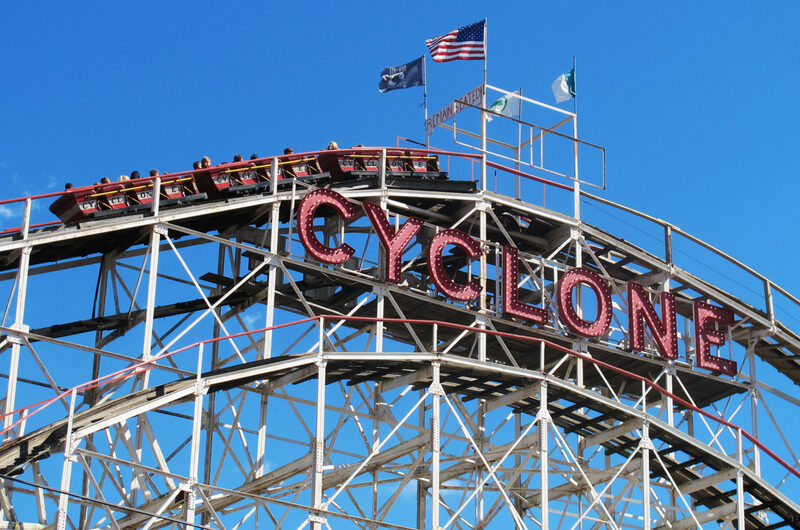 Once I even decided to act like a kid again and ride two of Coney Island’s landmark attractions: the 90-year-old Cyclone and the 98-year-old Deno’s Wonder Wheel. My ride on the Cyclone, a rickety, wooden roller coaster, lasted less than two heart-pounding minutes. 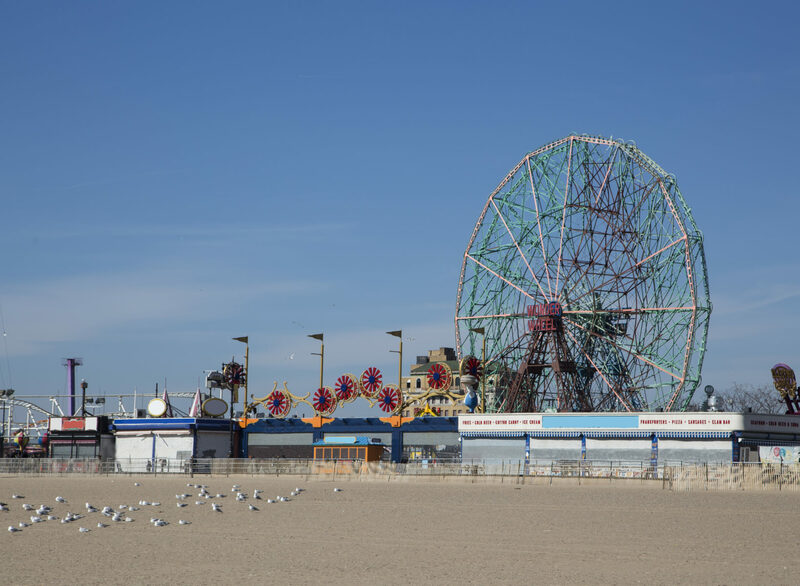 But it was the Wonder Wheel that stole the show — the 150-foot-tall ferris wheel has cars that slide back and forth, so they feel like they are about to fly off the track. Both are open on weekends from late March until Memorial Day and daily after that. Enjoy the Easter Parade and Bonnet Festival. New Yorkers don’t always make time for all the fun stuff the city is famous for, but I do try. So this spring, I plan to head to Fifth Avenue for my first-ever Easter parade. This year it coincides with April Fool’s Day, so I’m hoping the kooky hats and bonnets will be extra over-the-top. That leaves just one question: Should I be a spectator or a participant? Either way, I know I’ll enjoy myself just by being outside in springtime — and perhaps this will become the newest ritual to add to my list. While spring temperatures in New York generally range from the 50s to 70s, there’s a good chance you may encounter some inclement weather. Pack a small umbrella or foldable rain jacket to carry with you — and have a back-up plan (like going to a museum, shopping or a Broadway show).